Many enterprises (large and small) are focused on increasing their business flexibility while simplifying their IT infrastructure in order to better meet their business objectives. The IBM on demand Operating Environment (odOE) defines a set of integration and infrastructure management capabilities that enterprises can use to achieve these challenging objectives. 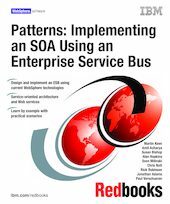 The odOE features of particular relevance to this IBM Redbooks publication are the use of a service-oriented architecture together with an Enterprise Service Bus. These are both necessary to achieve the goals of increased business flexibility and a simplified IT infrastructure. Many of these enterprises are determined to use proven architectures, designs and product mappings in order to speed their implementation and minimize their risk. Patterns for e-business is a group of proven, reusable assets that can be used to increase the speed of developing and deploying e-business applications. This book focuses on how the service-oriented architecture profile of the Process Integration patterns can be used to start implementing service-oriented architecture using an Enterprise Service Bus. Part 1 presents a description of service-oriented architecture and how it applies to Web services and e-business on demand. Emerging service-oriented architecture trends are also discussed. Part 2 provides a detailed description of the Enterprise Service Bus (ESB) concept, and how this fits with the Patterns for e-business. Common usage scenarios, a minimum capability ESB, and ESB patterns are described. IBM product mappings are then applied to the ESB patterns. Part 3 guides you through the process of implementing an Enterprise Service Bus using current IBM technologies. Router and Broker interactions within an Enterprise Service Bus are covered, along with off-the-bus service choreography and the Exposed ESB Gateway to enable interaction in an inter-enterprise environment. An updated SOA profile, and a description of how to implement SOA solutions in WebSphere Application Server V6, is described in the new book "Patterns: SOA with an Enterprise Service Bus in WebSphere Application Server V6"